Today the Marine Corps celebrates its 236th birthday. Happy birthday to all of my fellow Marines out there. Just like last year, I would like to pay tribute to one of my fellow Marines I served with. This year, that Marine is none other than the world famous Daryl Parker. You may recognize him from the second season of The History Channel’s show, Top Shot. Daryl’s military career actually began with a short stint in the United States Navy. He was looking for something a little more challenging and ended up doing an inter-service branch transfer to the Marine Corps for the remainder of his 21 year military career. When I first met him at HMLA-369 (MCAS Camp Pendleton, CA) in 1993, he was a Sergeant (E5). When I left, he was a Staff Sergeant on his way to becoming a warrant officer. Along the way, well… let’s just say he changed my life. While at HMLA-369, there were plenty of resources available to guide and mentor me on how to excel at my occupational specialty and be a better Intel analyst. However, it was Daryl Parker who taught me something even more important: how to excel at being a Marine. He mentored me on how to improve myself and my approach to leadership. He prepared me for two meritorious promotion examination boards, both of which I received meritorious promotions from. He helped me obtain my acceptance into the MECEP program. He was my martial arts instructor, teaching me discipline, control, and focus. He taught me life lessons that I will carry with me the rest of my days, teach my children, and teach my proteges whenever I am able. Daryl went on to serve Corps and Country, retiring in 2005 as a Chief Warrant Officer 3 with numerous awards, medals, and commendations. He is the embodiment of what it means to be a true patriot, and I can honestly say I am a better man for having had the privilege of serving with him and knowing him. Semper Fi, Daryl, and more importantly, thank you. Thank you for your service, and thank you for everything you did for me. 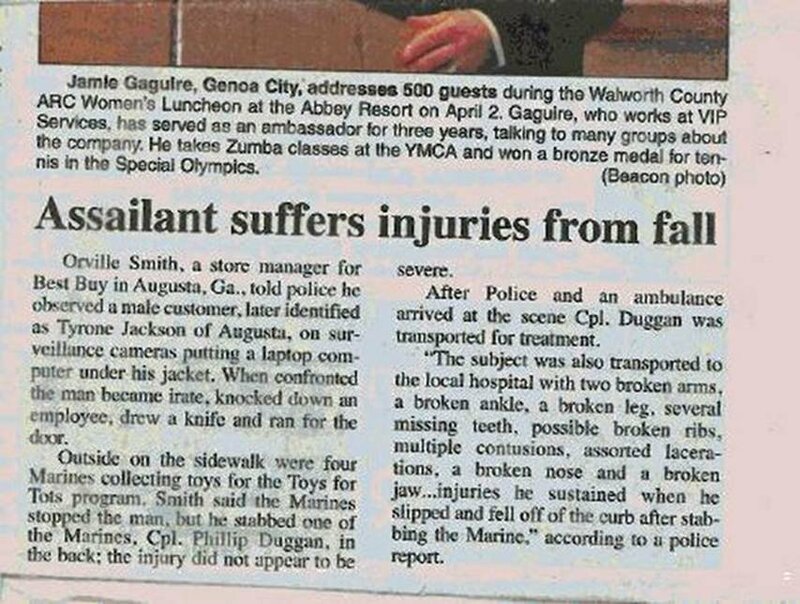 Semper Fi, Marines. God bless each and every one of you, but there is one in particular I would like to thank for his service today: Major Nigel Fischer. Nigel and I served at Marine Corps Light Attack Helicopter Squadron 369 in Camp Pendleton back in the mid-1990’s. Semper Fi, brother and God bless you and yours.